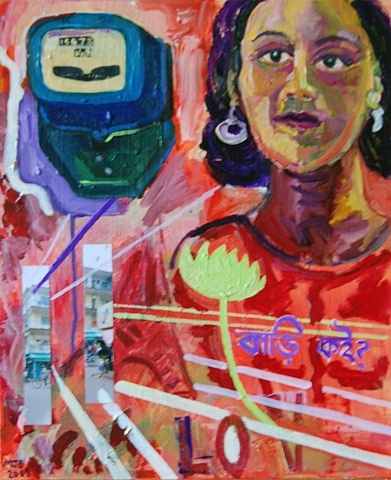 Galerie Deborah Zafman is pleased to present Tumi Ami: Spring Heat, an exhibition of paintings by Monica Jahan Bose. 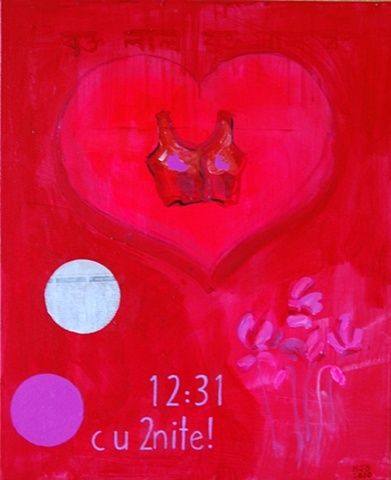 This exuberant spring show puts an emphasis on love and human connection in our complicated world. 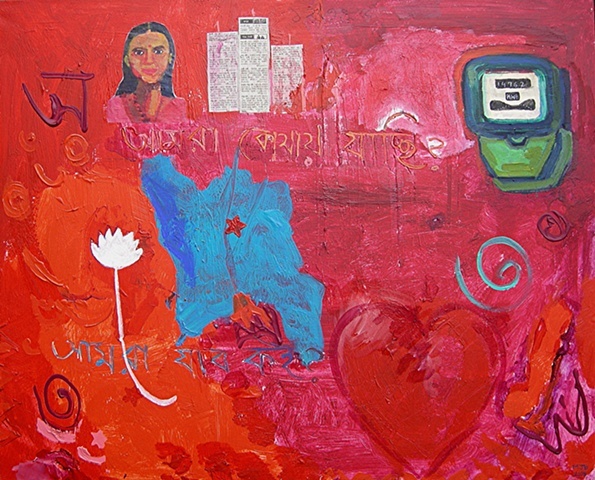 Tumi Ami means “You and I” in the artist’s native Bengali. 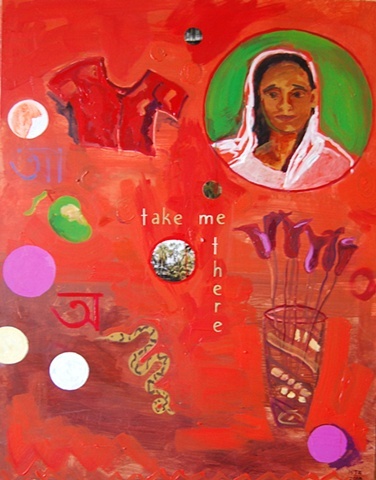 Monica Jahan Bose’s mixed media paintings chart out a personal language, reflecting the artist’s diverse professional background and heritage. 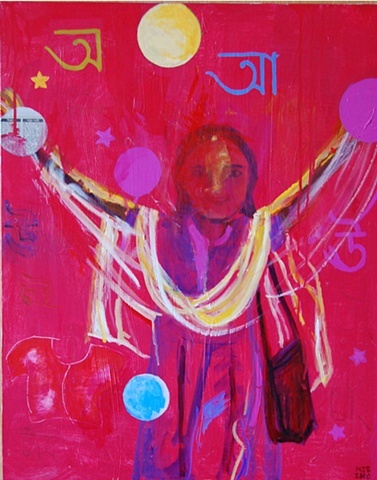 She has studied art, law, and mathematics and has been an artist, lawyer, activist, and teacher. She lives and works in Paris but was born in England to Bangladeshi parents – one Hindu, one Muslim – and brought up mostly in the United States. 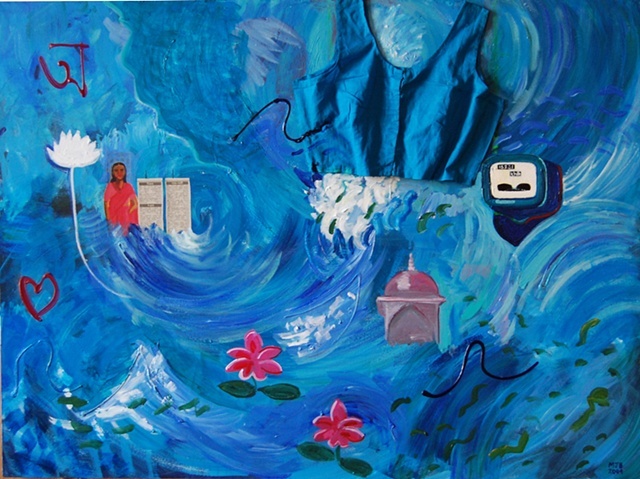 Her works are fragmented narratives, usually autobiographical, often grappling with issues such as the rights of women, religious fundamentalism, and global warming. 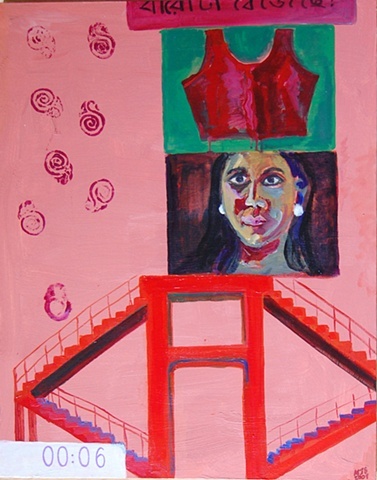 Her hybrid tableaus blend the direct and communicative language of Bengali folk-art and street art with bold expressive brushstrokes, collage, pop-art objects, and cut-out elements of her own photographs. 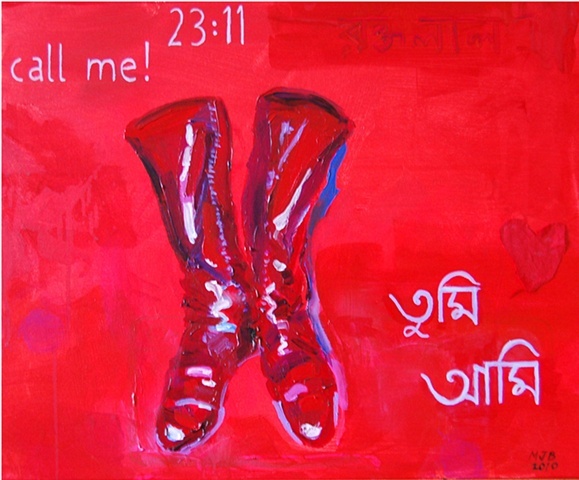 Using words and phrases in Bengali and English, and everyday and symbolic objects from East and West, Bose’s images pulsate with color and hidden multi-faceted messages about the joys and contradictions of our contemporary world. 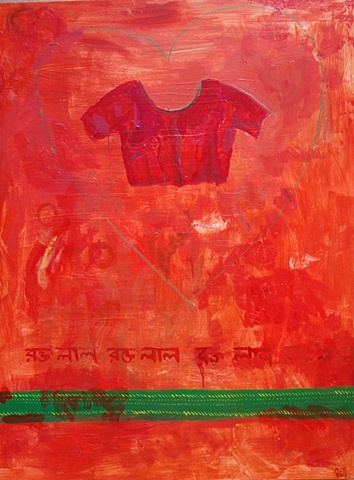 The sari blouse (choli) is a recurring motif in her works – a talisman for the female body, a reference to women’s sexuality, and a stand-in for the artist herself. Growing up in the West, Bose saw the sari as a symbolic link to her heritage (and even wore one to her high school prom). 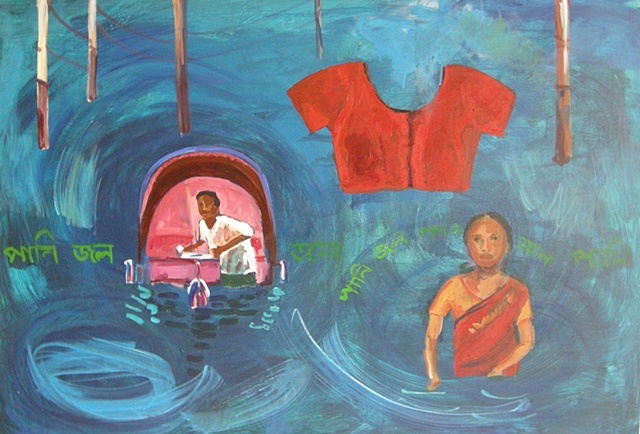 In her paintings, the sari blouse is shown uncovered, not hidden under the achal of the sari. 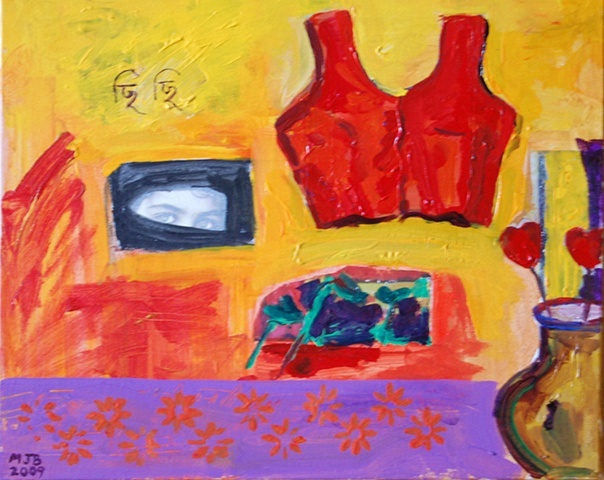 She often paints the sleeveless blouse, considered scandalous in some circles. 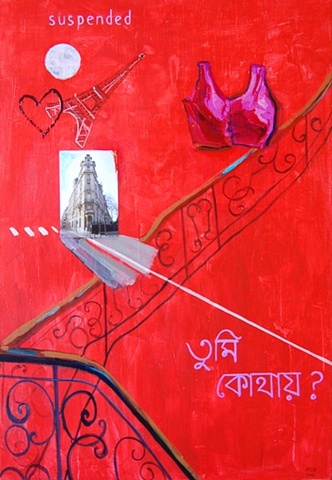 The usually hidden garment is placed in full view, sometimes with religious men and women looking on or mouthing taunting words in Bengali. 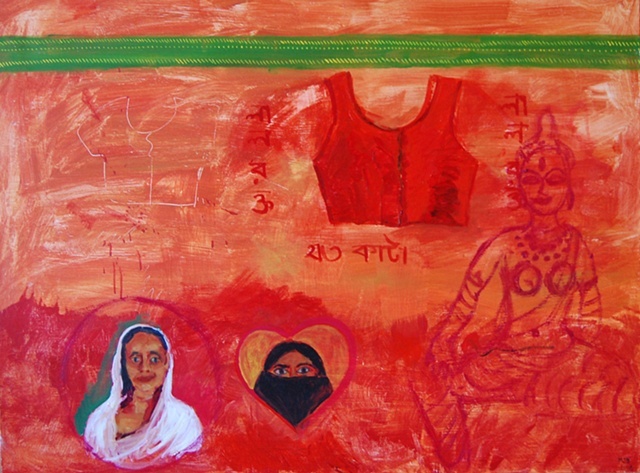 She also uses cutouts from the Bengali matrimonial advertisements to make hearts, circles, or apartment blocks, alluding to the commodification of women, marriage, and love. 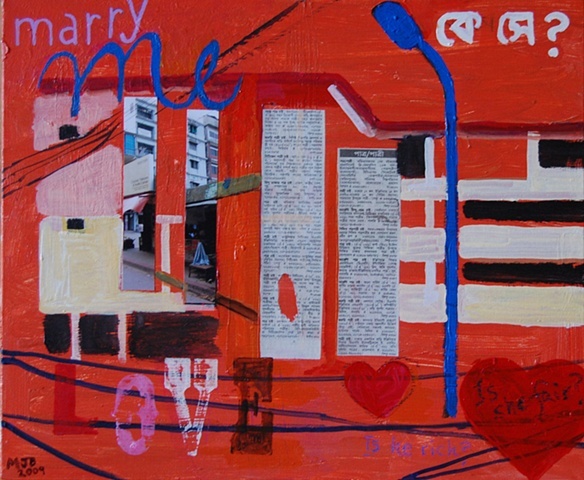 Her work references the internet, text messages, and mobile phones, new tools that defy traditional matchmaking attempts. 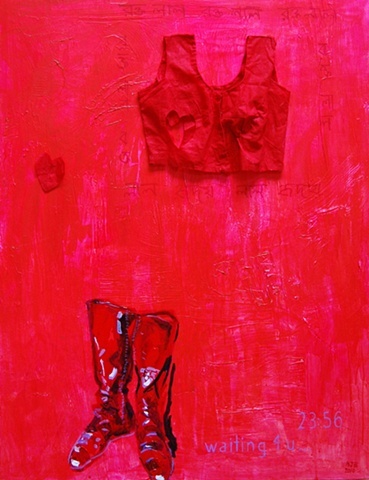 The color red in her work expresses heat, energy, passion, and blood. 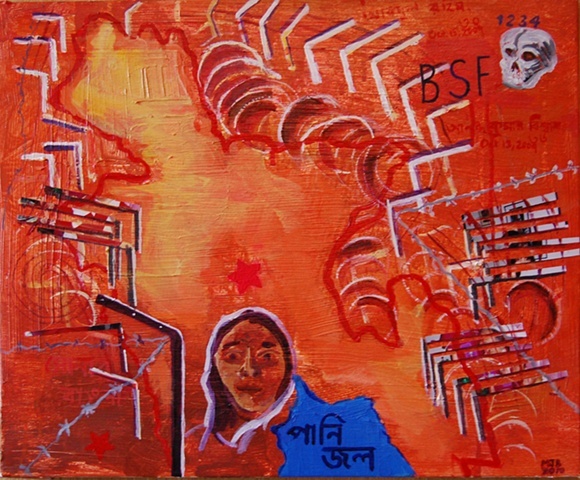 The words “Red Blood” (rokto lal) are often scrawled on her paintings, signaling the blood pumping in our veins as well as violence against women. Bose notes that Saudi Arabia banned the use of the color red in February 2009 to prevent people from celebrating Valentine’s Day. 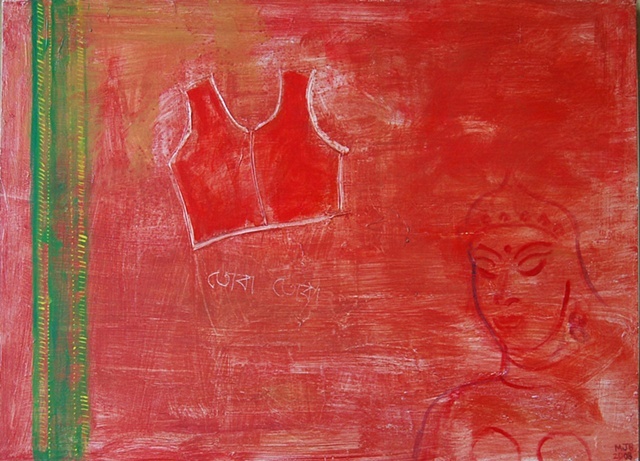 The artist paints in red in part as an act of defiance. 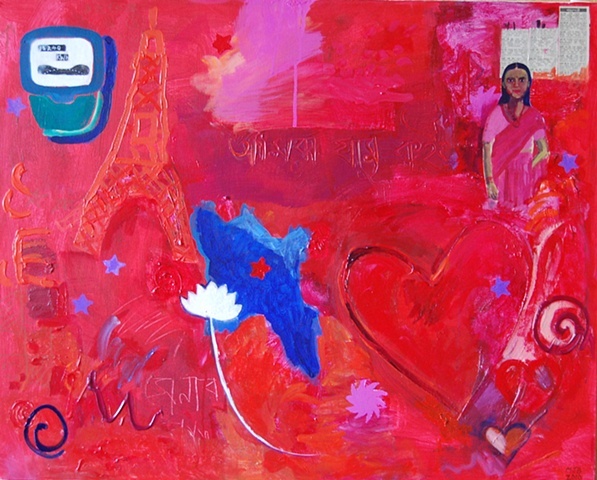 A Bangladeshi-American, Monica Jahan Bose currently lives and works in Paris. She studied art at Wesleyan University (USA), the University of California at Berkeley (USA), and at Shantiniketan (India), and has a law degree from Columbia University in New York. 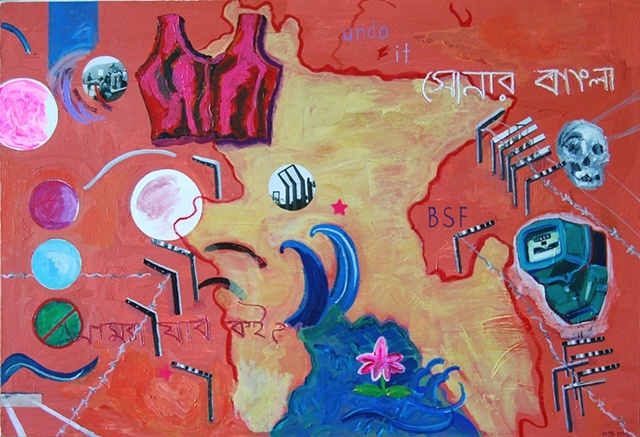 She has exhibited in Tokyo, Paris, New York, and Dhaka, Bangladesh, and is in numerous collections across the USA, Asia, and Europe. This is the artist’s second solo show in Paris.